The Jewel of Sugar Creek. Cr. 1851 Federal style architecture, was the Boarding House for the women that operated the spinning and loom equipment in the mills. The 1864 Mill is the remaining one of four mills, the roof is visable in the tree tops below the Inn. This Greek Revival style building was built to produce wool for the Civil War Union uniforms. The Boarding House has been re-commissioned as the INN, a beautiful B&B. Located at S.W. corner of Crawfordsville, IN on Sugar Creek. Scroll down. 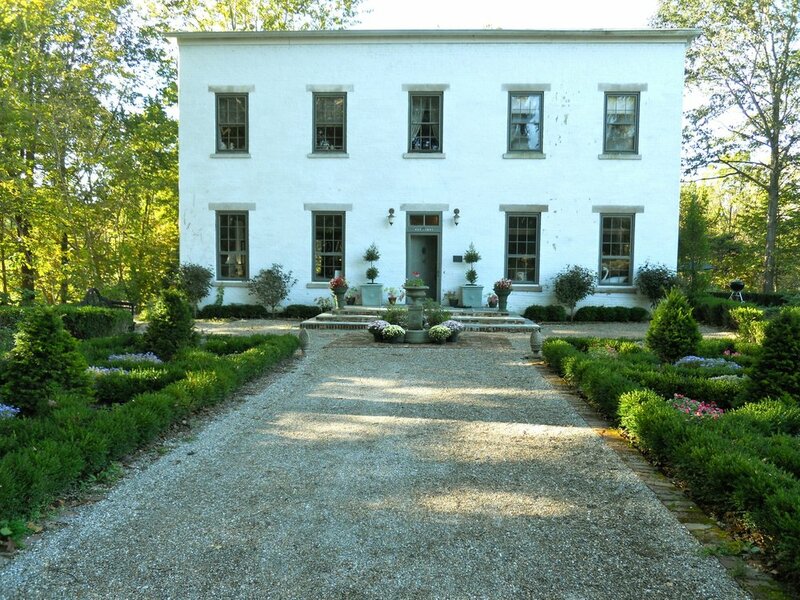 Perfect for a weekend of canoeing and hiking in Turkey Run or Shades State Parks.A scenic historic private estate & woods- Sugar Creek, for canoeing, artists, photographers, nature lovers, enjoy the creeks with gardens in privacy. This is one of 3 premier spots in the midwest for small mouth bass. Wildlife seen on property: Wild turkeys, fox, blue heron, turtles, eagles. Antique shops & entertainment 5 min, WabashCollege, Purdue University / Lafayette, TurkeyRun and Shades State Parks are near. Nature trails, the historic woolen mill interior, canoe launch on sugar creek. Formal gardens, lawn games, fossil beds along Sugar Creek. Painting and photography is encouraged. Fishing with a license. No pets and no smoking permitted. Only registered guests are allowed on the Mill property, INN, and Vacation Cottage unless approved for a special event. Direct reservation is required. Enjoy a special breakfast made with fresh ingredients, gourmet coffee, tea, fresh farm eggs, and fresh fruit compote. Website design Barbara Brookie White. All photos and content are the property of Yountsville Mill Properties.